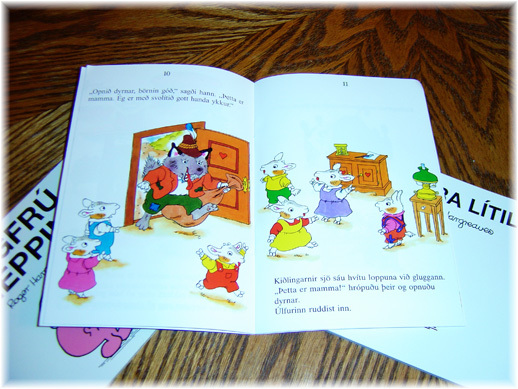 I got a package from my sister in the mail this week, it included some Icelandic childrens books, and bland í poka (blend in a bag), essentially a variety bag of typical Icelandic candy. 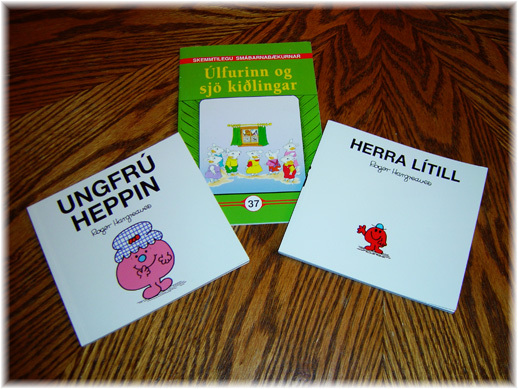 She sent me three childrens books that she picked up for me on her recent trip to Iceland: Ungfrú Heppin (Little Miss Lucky), Herra Lítill (Mister Little), and Úlfurinn og sjö kiðlingar (The Wolf and Seven Kids). 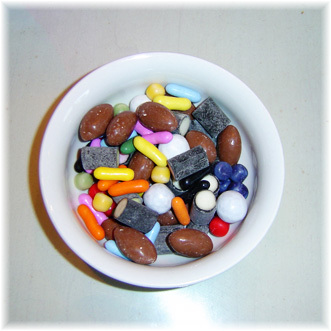 This is bland í poka (blend in a bag), a variety bag of Icelandic candies. It has some chocolate covered caramels, candy coated chocolate covered licorice (the white balls), candy coated licorice (look like Good & Plenty's), licorice wrapped marzipan and the tiny little ones are chewy and fruit flavored. I LOVE chocolate covered licorice, they were the first to go. I don't think I've ever had chocolate covered licorice. Good 'n' Plenty's are among my favorite candies. It's good, if you like licorice... I like it best when it's good solid black licorice like this pic. I've been thinking of trying to make my own. The chocolate covered licorice would be the first to go here too! YUMMY! Thank you Erin! :) It was a few late late nights, but worth it in the end.